Camera enthusiasts assembled on a stage in Tokyo on Thursday for a traditional group photo, taken by a photographer in front of them. But as they gathered, they lifted slender stick-like cameras above their heads, instantly grabbing 360-degree pics of the room. Call it the 360 selfie. The event at Tokyo’s Miraikan technology museum was sponsored by camera maker Ricoh, and its purpose was to award winners in a contest of apps for the company’s Theta, a 360-degree camera whose latest version, the m15, can also record video. More and more panoramic cameras are getting into the hands of consumers and professionals these days, with famous brands like Ricoh and Nokia as well as startups such as Canada’s Bubl rolling out their own omnidirectional shooters. Most people are familiar with 360-degree views through Google Street View images, as well as photo-stitching apps like Photo Sphere. But the spread of cameras that can grab a 360-degree view with just one click is also inspiring new applications that could change photography in the same way that smartphones sparked a selfie explosion. Holobuilder is a web-based platform that creates augmented reality and virtual reality views based on 360-degree imagery. Developed by Germany-based Bitstars, it can be used to link “photospheres” together in a kind of Street View-like virtual tour through an environment. Holobuilder is an app that allows users to insert 3D objects, text and links into 360-degree images, as well as create virtual tours by linking photosphere pics. What’s more compelling, though, is its ability to incorporate virtual 3D objects and information into a scene. For instance, a 360-degree image of a sunlit park could be embellished with a 3D object in the sky such as an airplane, or an image taken inside an empty house on the market could be decorated with virtual furniture or text. “You can add interactive content such as website links and you can use it on platforms like Oculus Rift and Google Cardboard,” said Bitstars founder Mostafa Akbari, adding that people in construction and online retailing have been prominent users. While Holobuilder works with photo-stitching apps as well as the Theta, the former are much more time consuming, requiring many pics to create a sphere. Other apps that work with the Theta provide some clues about how the technology could be adopted. Developed by Zoomscape of Otsu City, Japan, PanoMeasure 2 can extrapolate distances between points in a 360-degree image, and can be used for everything from architectural design to measuring and checking infrastructure in hanging ceilings. Another industrial project is Kirari Ninja, developed in part by shipping company NYK Line, and it involves putting a Theta camera inside a small box lined with bright lights. It can take a 10-minute panoramic exposure when raised through the cylinder of a ship’s engine, allowing inspectors to get a close-up view of potential cracks during maintenance while reducing inspection time. Location-based apps, however, seem a natural fit for spherical imagery. Journey360, created by Tokyo-based Tao Software, is a free Android app that lets users create custom maps enhanced with images and videos. For instance, they can take a photo of a pamphlet map of an amusement park, and then add 360-degree pics and videos to it to create a kind of 3D photo album. The imagery appears as clickable spheres on the marked-up map in Journey360. It’s like a simplified version of Street View that can also be ported to head-mounted displays, said Tao developer Chisato Karakama. Some developers are launching panoramic pic apps for niche users. 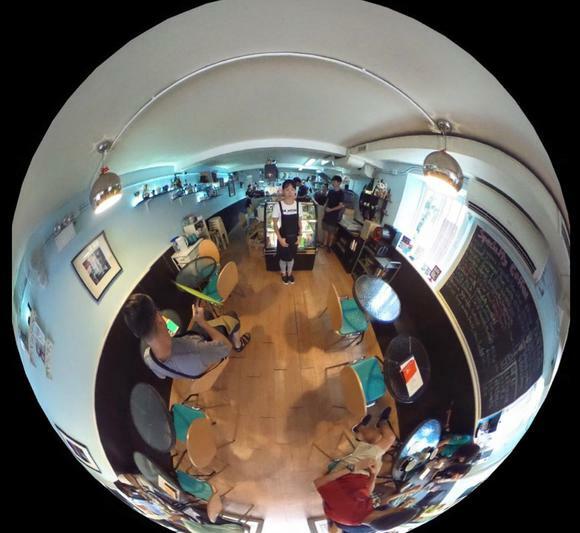 Hong Kong developer Erica Leung created 360 Coffee Shop, which combines maps with spherical shots taken in cafés. Users can get a better feel for what an unfamiliar shop is like compared to a 2D photo. The app’s Facebook page brims with snaps of establishments such as Kowloon’s Medieval Weapon Cafe, which has beans, baristas and broadswords.